Figure 9.68 Sign of the times. 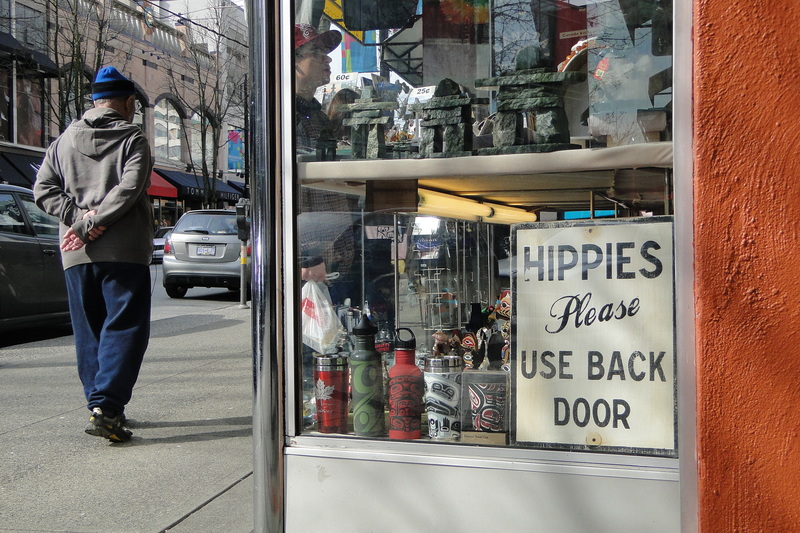 An anti-hippy notice survives in a Vancouver antique store. There were international events that encouraged a questioning of the status quo, of which the Second Vatican Council (Vatican II) beginning in 1962 was among the most prominent. Also, the apparent ratcheting up of tension on the Cold War front gave people everywhere good reason to think that the current situation was untenable. The American U-2 spy plane fiasco over Russia in 1960, the Bay of Pigs Invasion in April 1961, followed a few months later by the erection of the Berlin Wall, and the near-catastrophe of the Cuban Missile Crisis of October 1962 all contributed to a sense of unease. The assassination of United States President John F. Kennedy on 22 November 1963 was similarly shocking and it gave a special posthumous force to his admonition to do service through institutions like the Peace Corps. Overwhelmingly, however, the single greatest factor causing social change was the numbers. By the mid-1960s more than half of Canada’s population of 20 million was under the age of 25. The baby boom started slowing in the late 1950s, but it would take until the 1980s before it would finish growing up. Four decades of a population juggernaut passing through childhood and adolescence into adulthood was bound to impact many aspects of Canadian life. The fact that other countries were experiencing the same phenomenon simply magnified the sense that this was all part of an emerging global norm. Of course, the baby boomers were more likely to be found in countries that had experienced prosperity in the 1920s, high unemployment in the 1930s, and total war from 1939 (or, in the case of the United States, 1941) to 1945. Nations that retooled from command-led economies to demand-led consumer economies were more like Canada than those that did not or (like Britain) were slow to do so. Canadian post-war prosperity fed this demographic engine and created the conditions under which it would produce a critique of its parents’ world. Historian Christopher Dummitt has described how this generation began entering the workforce in large numbers around 1960-63. The availability of good paying work and a shortage of labour meant that there was every incentive for males in particular to leave school as early as possible — typically at 16 — and take a job. University opportunities were increasing but still 90% of “youth moved directly into the paid labour market.” Within a matter of years these young labourers were a significant presence within Canadian labour organizations and they were in large part responsible for an astonishing 9.3% growth in membership between the start and end of 1965 alone. These younger, new members, however, often had political agendas that were distinct from those of their elders. They were, for one thing, less deferential toward authority, more likely to be advocates for workers’ control of the workplace or industrial democracy, and inclined to question the career arc of working hard for one company for years and settling into domestic normalcy. More young women wanted to work and to pursue careers, and more young men experienced a sense of economic freedom rather than their parents’ fear of unemployment. As for that 10% that went on to university, one-tenth of a rapidly growing pie strained the post-secondary system across the country. Existing universities were expanded but the real growth occurred in the number and variety of institutions. Between 1945 and 1959 only three new universities opened; between 1960 and 1969 another 13 were added. The college sector grew as well, vastly increasing vocational training opportunities. The expansion of Canada into the West brought with it models of education that had roots trailing back to the St. Lawrence Valley and from there to New England, to Oxford and Cambridge, and even to Germany. The new provinces might have experimented with different models but they all placed their bets on universities that would disseminate established Euro-Canadian educational ideals of knowledge and learning. Consistency, rather than innovation in this respect was more important. In this way, the universities of the West became instruments of colonialism and also expressions of provincial power. This is perhaps most clearly seen in the history of the University of Saskatchewan, established “as one of the foundational institutions of the young province,” only two years after the province itself came into being in 1905. This is to say that universities were not politically neutral nor utterly objective institutions: they had a mandate. Their transformation in the 1950s, ’60s, and ’70s into massified operations witnessed challenges to many of these post-secondary sectoral assumptions. 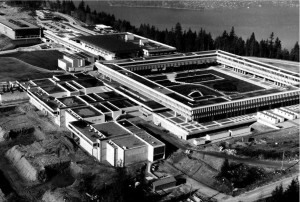 Figure 9.69 One of many new universities built to serve the baby boom generation, Simon Fraser University opened to unrest and student protests. The growth of youth numbers in the workforce and on campus set the stage for what is sometimes called the counterculture phenomenon. Several factors were involved. American media played an important role in familiarizing Canadian households with dissent. United States news broadcasts brought coverage of the often violent civil rights movement into Canadian living rooms. Adults and youths far from Mississippi became familiar with the struggle of African-Americans to acquire a greater degree of social and political equality in the 1950s and ‘60s. Likewise, the American war against Vietnam (which picked up as the French imperialist forces retreated from Indo-China in the mid-1950s and lasted until 1975) produced news of American atrocities and incompetence. These were echoed in images of growing domestic protests against the war. Much of the activism behind both of these movements could be found on American university campuses. American professors and students were making their way to expanding Canadian universities — especially the new ones — and the traffic in ideas further bonded those campus environments together. The rise of Second Wave Feminism in these years (see Section 7.10) provided yet another critique of the status quo, as did the emergence of the American Indian Movement (AIM) (in which many Canadian Aboriginal men and women participated). Socialist elements in these movements tended to align with what was called the New Left. Efforts to scotch pro-communist feeling in North America in the 1950s had forced even social democratic parties like the Cooperative Commonwealth Federation further to the right. Joined up with a fairly conservative trade union movement headed by the Canadian Labour Congress in 1961, the emergent New Democratic Party attracted many young people on the left but it fell short for many as well. Advocates of the New Left — it was neither a party nor an organization, more a set of shared beliefs — directly challenged the anti-Soviet, red-baiting propensities of the Cold Warriors in North America. On campus and on city streets, the protest leaders of this decade favoured civil disobedience over the ballot box. Protest rallies, marches, sit-ins, and demonstrations — or demos — were the tactic of choice. Campus protests peaked in 1968, the same year as militance in Paris was cresting and the Prague Spring. It needs to be said that many student populations in Canada were not radicalized and, on many campuses, student elections soon saw moderates replace radicals. The impact of this brief moment in Canadian intellectual history, however, was significant in that it drew into question hitherto unassailable institutions and politicized a generation of people on- and off-campus. The new wave of cultural dissent that arose in the 1960s was in many respects a resumption of earlier historic trends. The total package of the counterculture offered an alternative to the bland homogeneity of middle-class life, patriarchal family structures, self-discipline, unquestioning support for the United States, and the acquisition of property. In fact, there were many alternative cultures, some of which were more visible than others. Hippies rejected the conventions of traditional society. Men sported beards and grew their hair very long; both men and women wore clothing from non-Western cultures, made a point of defying their parents, rejected what were regarded as traditional social manners, and turned to music as an expression of their sense of self. Drug use, especially of marijuana and psychedelic drugs like lysergic acid diethylamide (LSD) was common and symbolic of a break with authority. Most hippies were also deeply attracted to the ideas of peace and freedom. Some hippies “dropped out” of mainstream society altogether and expressed their disillusionment with the cultural and spiritual limitations of the Western world. They joined communes, usually in rural areas, to share a desire to live closer to nature and respect the earth, and share a dislike of modern life and a disdain for wealth and material goods. Many communes grew their own organic food. Others abolished the concept of private property, and members shared willingly with one another. Some sought to abolish traditional ideas regarding love and marriage; free love was practiced openly, and there was some support for the emergent cause of gay rights. Figure 9.70 An anti-Vietnam War protest march on Vancouver’s West Georgia Street in 1968. Lines between movements were blurry. Many New Leftists were also hippies but not all hippies were consciously supporters of the New Left. Nonetheless, a common denominator was their shared opposition to the war in Vietnam. In Canada this played out as an increasingly vocal strain of anti-Americanism on the left, a movement that called simultaneously for a more independent Canada. So, while in the United States hippies were challenging American patriotism, in Canada Canadian hippies contributed — ironically — to a growing sense of Canadian nationalism. Some 30,000 American males, many of them hippies, crossed the border in these years in the largest northbound migration wave since the Loyalists arrived in the late 18th century. In this case, however, they were fleeing “the draft” — conscription to serve in the Vietnam War. White, middle-class Americans with some university education were over-represented among the draft dodgers, so they proved to be an articulate and largely invisible group in Canada’s white, middle-class cities. Significant numbers — including large numbers of women — pursued the goal of communal self-sufficiency on farms in the Kootenays and along the coast and islands of the Strait of Georgia (aka: Salish Sea). Mark Vonnegut (b.1947), the son of the famous American anti-war author, Kurt Vonnegut, wrote of his experiences on the coast in a hippie commune in The Eden Express (1975). Hippiedom reached its highwater mark around 1970, after which its appeal diminished. Some of the political energy went to the Yippie (Youth International Party) movement. The beginnings of the war on drugs also played a role in the movement’s decline. The “acid rock” elements that were featured at the 1969 Woodstock Festival in New York (attended by thousands of Canadians among the half million-strong crowd) included Jimi Hendrix — who spent much of his childhood in Vancouver. In 1970 Hendrix was one of several hippie/rock musicians to die from a drug overdose, events that further compromised the hippie ideal. As the war in Vietnam wound down, the movement lost another of its main rallying points. Economic uncertainty and rising unemployment following 1973 refocused many young people on finding a secure place in the mainstream. Inevitably, successive cohorts of baby boomers would seek to express themselves in ways that were distinct from that of older (hippy) siblings. The liberating impact of the hippies in terms of fashions, art, and sexual relations was doubtlessly the movement’s greatest legacy. The arrival of the massive baby boom generation in the workplace and on campuses served to challenge established norms of behaviour in the 1960s. Increases in the size, number, and variety of post-secondary institutions was required by the rise of the baby boom population and a relatively new demand for access by social classes and groups that had not been much of a presence on campus before. 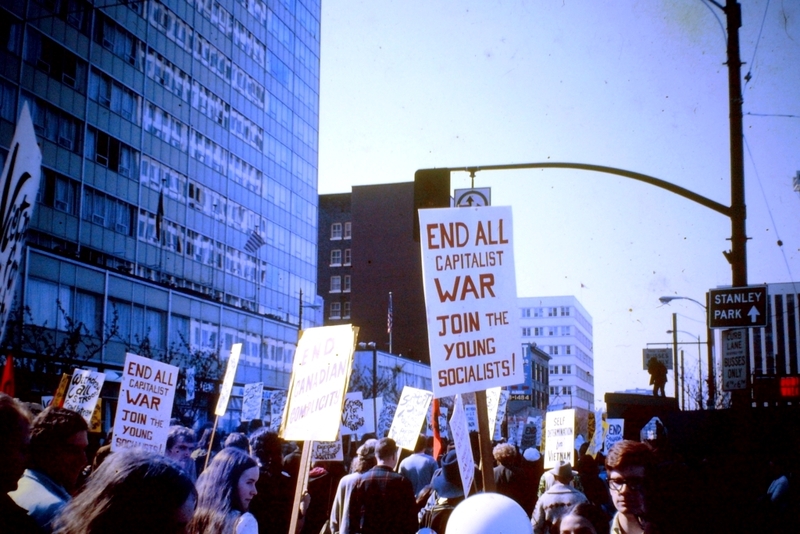 Events in the United States — including the Civil Rights Movement and the war in Vietnam — stimulated the growth of protest movements there and these had an influence on Canadian youth as well. Student protests were strongly influenced by the New Left and some campuses offered up a comprehensive critique of modern society and its institutions. Elements of these protest movements contributed to the appearance of the hippy phenomenon and the full-scale counterculture movement. The arrival of American draft dodgers added around 30,000 young Americans to the population and further contributed to a deepening generation gap. 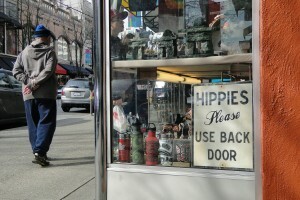 Hippies Please Use Back Door – Antique Sign – Robson Street – Vancouver BC – Canada by Adam Jones, Ph.D. is used under CC-BY-SA-3.0 license. Sfu 1967 by Soggybread is used under CC-BY-SA-3.0 license. 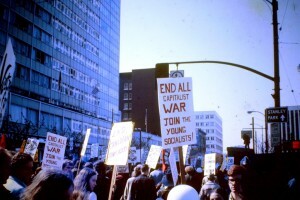 Anti Vietnam war demonstration. Vancouver, BC. 1968 by John Hill is used under CC-BY-SA-4.0 license. 9.16 The 1960s Counterculture by John Douglas Belshaw is licensed under a Creative Commons Attribution 4.0 International License, except where otherwise noted.